It seems there’s a toddler tapping away at an iPhone or iPad everywhere you turn these days. There’s even a toddler training toilet that you can attach an iPad to while your kiddo tends to business. While some parents tout the tablet as a “lifesaver,” others fear the detrimental effect technology might have on baby’s developing brain. Inhabitots is running a series of stories on technology and its impact on children, families and mental and physical health. Every parent should be aware of these startling statistics about addiction to iphones and screens, as well as the many downfalls of kids’ addiction to tech, and why limiting screen time will benefit your child. If you decide to cut back on screen time in your home, you’ll be both fascinated and delighted by our story on why limiting technology among your brood will not only save you thousands of dollars, it will also help save the planet. Some fun, unplugged alternatives to the beloved iPhone are this wooden iPhone toy which features 12 wooden block “Apps” that fit into the rectangular phone puzzle. If your baby loves to chow down on your smart phone, hand him this all-natural wooden iPhone toy that’s totally safe to chomp. My First Smart Phone encourages imagination over screen time with its chalkboard surface that swaps swiping for original doodles. If you’re wondering how exactly to keep your tots entertained or pacified sans screens — try one of these reusable game boards instead, and learn some really engaging games to play together using something really “smart” — your little one’s unique and beautiful mind. It seems there's a toddler tapping away at an iPhone or iPad everywhere you turn these days. There's even a toddler training toilet that you can attach an iPad to while your kiddo tends to business. While some parents tout the tablet as a "lifesaver," others fear the detrimental effect technology might have on baby's developing brain. Inhabitots is running a series of stories on technology and its impact on children, families and mental and physical health. Every parent should be aware of these startling statistics about addiction to iphones and screens, as well as the many downfalls of kids' addiction to tech, and why limiting screen time will benefit your child. If you decide to cut back on screen time in your home, you'll be both fascinated and delighted by our story on why limiting technology among your brood will not only save you thousands of dollars, it will also help save the planet. 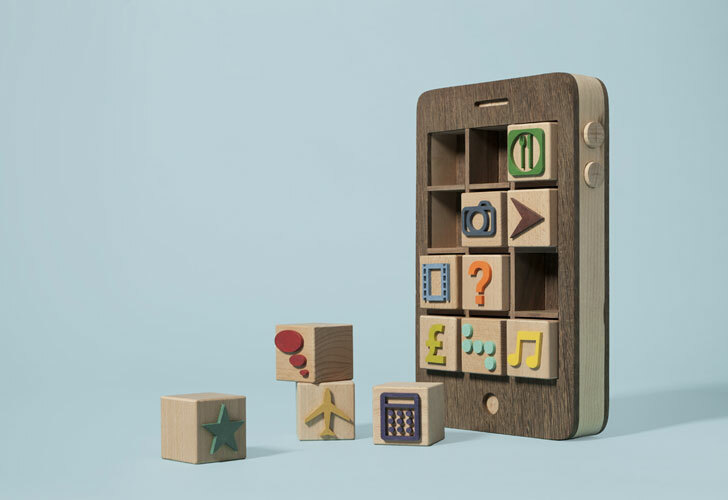 Some fun, unplugged alternatives to the beloved iPhone are this wooden iPhone toy which features 12 wooden block "Apps" that fit into the rectangular phone puzzle. If your baby loves to chow down on your smart phone, hand him this all-natural wooden iPhone toy that's totally safe to chomp. My First Smart Phone encourages imagination over screen time with its chalkboard surface that swaps swiping for original doodles. If you're wondering how exactly to keep your tots entertained or pacified sans screens -- try one of these reusable game boards instead, and learn some really engaging games to play together using something really "smart" --� your little one's unique and beautiful mind.